Precast concrete park bench; a timeless classic, yielding a smart look that is agreeable in any environment. 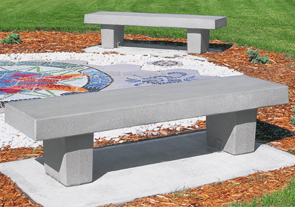 This classic precast concrete park bench is made from Portland cement (ASTM C150, all aggregates meet ASTM C33) reinforced with 3/8" diameter steel rebar. Models offered with both one and two sided stainless steel skate edging. 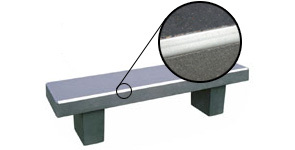 Protective edging extends life span by minimizing damage cause by skater use and thus helps maintain the concrete park bench's comfort. Available in variety of finish options; Weatherstone, Smooth Stained and Ground Glass Concrete; each concrete finish style offers specific color options as shown.